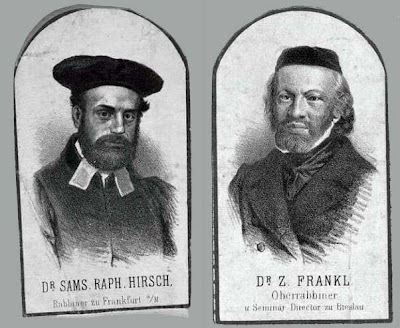 In this article, R. Hirsch quotes a young Hermann Cohen's letter that he received which described R. Frankel as a pious Jew: "mit dem Tallith über dem kopf in der Synagoge stehe," praying with the tallis over his head, "Freitag Abend Semiroth singe," singing zemiros on schabbos, and even "auch beim Schiur bei Gelegenheit eifrig bemerke: ein Jere Schamaim muesse hier machmir sein!," sometimes saying in his shiurim that Yarei Shamayim should be machmir! Hermann Cohen* (1842-1918) was then a young student in R. Frankel's rabbinical seminary in Breslau at the time when the controversy between R. Hirsch's Neo-Orthodoxy and R. Frankel (representing the so-called Historical School) was raging. At that particular time the issue was not the seminary, but Frankel's Darkhei Ha-Mishnah (1859). Cohen sent this letter to R. Hirsch in his teacher's defense. R. Hirsch, of course, responded that Frankel's pious behavior are entirely besides the point. Indeed, no negligible number of those attracted to R. Hirsch's teachings and leadership were hardly scrupulously observant. But they were Orthodox, and in those times (and R. Hirsch would say in all times) that was the ikkar. * A possibly interesting footnote: Hermann Cohen was the subject of the young R. J.B. Soloveitchik's doctorate.